A manufacturer of welding systems wanted to realize a welding system, with which it should be possible to process metal tubes with a diameter of up to 2500mm and an overall length to 4000mm. The special feature of this system should be their high flexibility and precision welding to process the work pieces in every conceivable position and accuracy. 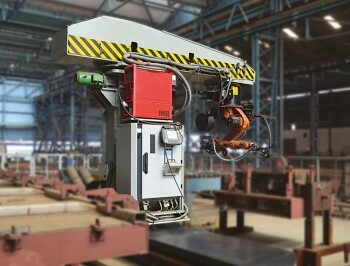 To ensure the flexibility of the system, a welding robot was mounted on a pivoting arm which can be rotated by 360 °. 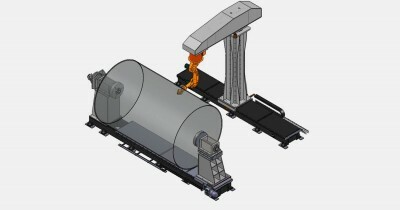 Simultaneously, it was possible to move the whole system over a travel of 5500mm to create as uniform horizontal welds. For the drive of the pivoting arm was used a ATLANTA B-Servo was worm gear with a module 5 pinion shaft and a lubrication system. The drive of the driving axis took over a rack and pinion consisting of BR racks Q10, a B servo worm gear incl. pinion shaft and a lubrication system.